Beskrivelsen er på engelsk, håper dere likevel forstår det! Here i used black cardstock and foil tape and went over with TH texture hammer and black staz On. Grunge tag made of the packing of TH supplies. 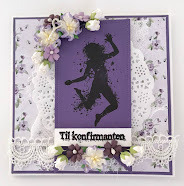 Embossed with Sizzix clock embossing folder and painted over with distress paint. Then used distress ink over. The wings are cut out from the love stuck die.